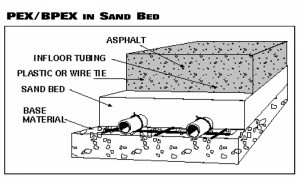 Infloor Snowmelt systems can be installed in the asphalt layer or in the sand bed under the asphalt. 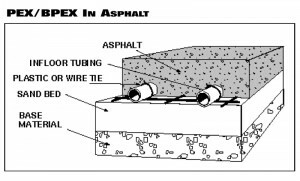 These types of systems require certain maximum temperatures for the asphalt as well as require water to be run through the tubing during installation. There are special considerations that need to be taken into account with an asphalt system, but it is a completely viable solution.